This program has gone through various stages of growth over its 30 years, 29 years — and the first four years, nothing was like it. Every week we were adding a station or two. Some weeks we added 10 stations. We started with 56, and in four years we’re up to 500 stations. And throughout that four-year period the excitement of adding an affiliate and announcing it and going out doing a Rush to Excellence show in these various markets, I mean, it was exciting. The growth, we were chronicling it. It was something fun and it was something great to be part of — and, of course, the audience was part of it. They were making it happen. And then we topped out somewhere in the mid-nineties at around 630, 640 stations, and now we go back and forth. As some stations consolidate and combine, we combine AM and FM in certain markets, we’re now roughly at 615 to 620, and we’re pretty stable. So there’s no growth announcement there. Our audience (chuckling) is skyrocketing upward. But I don’t like to get specific about that, and certainly I don’t like to talk about it often, but we’re up now to a weekly “cume” [cumulative audience] of just shy of 27 million people. Now with the redesigned app, people are flocking to RushLimbaugh.com and that app in droves. And it reminds me of the excitement and the growth of the first four years of the radio show. Now, it’s not exactly the same. It’s not happening… We’re not adding numbers of users in a comparable amount to the numbers of stations we were adding on a percentage basis. But it’s a huge database of people that we have. It’s larger than any of us ever imagined it was gonna be, particularly when we put it behind a pay wall. And yet it just continues to grow. And one day last week we had over 1,500 people join the website. It’s just unheard of. And all of it is due to new app that we’ve redesigned, and we just the day before yesterday issued an upgrade and update to the app. We upgraded a few things, and I got a list last night. I put a list together of some of the things. I’ve been reading comments from some of the people using the app, some of the things they want to see changed in the app, additions made to make it a little bit more intuitive in places, a little bit more usable in other areas. And they’re all great ideas, and I sat down last night and I called the developers. (I sent ’em a note; I don’t call anybody.) I compiled a list here, and we’re gonna get moving on a lot of these things ’cause they’re fabulous. These ideas that people have suggested are great. So if you have the app, whether you’re a paid member of the website or not, remember, there’s so much available on the free side. There are transcripts to everything that’s said on this program, and those transcripts you can now share via Twitter, Facebook, email, messages, however you want. Video clips from the Dittocam and other things that you can watch, clips from the old Rush Limbaugh TV show, other things. There’s a whole lot on the free side of this. You know, people say, “Do I have to pay anything to use your app?” No, you don’t. You don’t have to pay a dime to have access to everything that’s said on this program. Now, you don’t get the Dittocam and you don’t get the audio stream if you’re not a member, but you get the transcripts. You can still access everything that’s said, and you have the ability to share those transcripts to anybody you want. If you hear something you thought was really good that you’d like to tell somebody about it, you don’t have to remember now; just share it. So it’s exciting for me. It’s exciting to see this kind of growth and I want to continue it, and that’s why we’re gonna spend some time upgrading this app. It’s not gonna happen lickety-split, overnight. App upgrading, the coding that has to be done — and then you have to go through the approval process each time you do it at the App Store. So it’s not gonna be instantaneous every time, but we can do it rapidly because some of these things are gonna be easy to do. 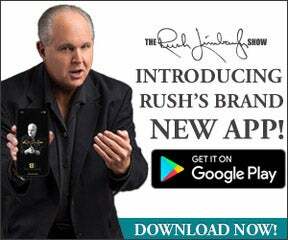 So if you are a user or subscriber to RushLimbaugh.com and you’ve recently downloaded the Rush Limbaugh app from either the Android Google Play Store or the iOS Apple Store just keep a sharp eye, because the upgrades are coming in the near future. I just want to thank you again for making all this happen. ‘Cause it’s thrilling to go through the cycle here of expansion and growth all over again, albeit in a new area with the app and the website. RushLimbaugh.com: The Updated Rush App: It’s Dope!